Samsung has the factory hamster wheels oiled and has started mass-production of 128GB solid-state hard drives. The company usually says nothing about the price of its new products, and it's sticking to that line today. However, Samsung promises the production ramp will be accompanied by "more attractive pricing" for the latest set of solid-state drives (SSDs). Of course, attraction is a notoriously held property of I. B. Holder, so let speculation commence. A Samsung spokesman told El Reg the drives would be of "greater interest than past SSD offerings", but wouldn't go further than that. The drives are available in 1.8in and 2.5in versions in either 128GB or 64GB raw capacities. They're based on multi-level cell technology (MLC), the slower, less energy-efficient cousin of single-level cell (SLC) drives — but less expensive to make. Samsung says the SSDs have a write speed of 70MB/s and read speeds of 90MB/s. Certainly not the fastest SSDs out there - or hard drives, for that matter - but good enough for most. Notably, the company claims its drives will outlive even the customer. It states the new 128GB SSDs will last "approximately 20 times longer than the generally accepted 4-5 year life span of a notebook PC hard drive". That's 80-100 years before it kicks. 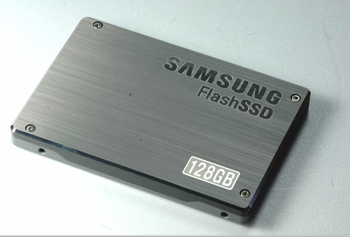 Samsung said the 128GB drives consist of 64 MLC NAND flash memory chips of 16Gb each. They only burn 0.2W in standby mode and 0.5W in active mode.